The productive collaboration of the Italian clothing brand Liu Jo and the legendary model Kate Moss is still going on as the British beauty is the first face of the Liu Jo Jeans, Liu Jo Shoes and Accessories lines for the coming season. Shot by Solve Sundsbo, Kate Moss looks stunning in the latest spring summer 2013 campaign by Liu Jo, demonstrating the range of the feminine garments as well as the pieces in the casual style. The photoshoot for this Liu Jo spring summer 2013 campaign took part in the magical Ibize. Surrounded by the beautiful flowers and a pool, Kate appears absolutely gorgeous and romantic. For the coming season, the Liu Jo spring summer 2013 collection delivers the classy and at the same time feminine designs in the soft pastel and neutral shades along with the key colors of the season including the blues, emerald greens, black and whites, pinks and turquoises. The collection was influenced by the glam 60’s style and features the soft lines, playful florals, beautiful embroidery, pleats, sheer chiffon and romantic lace, which ideally reproduces the retro style. As for the accessories, the looks are complemented with the platform high-heeled sandals in the color-blocking gamma, bags with gold detailing, thing belts and classy necklaces. 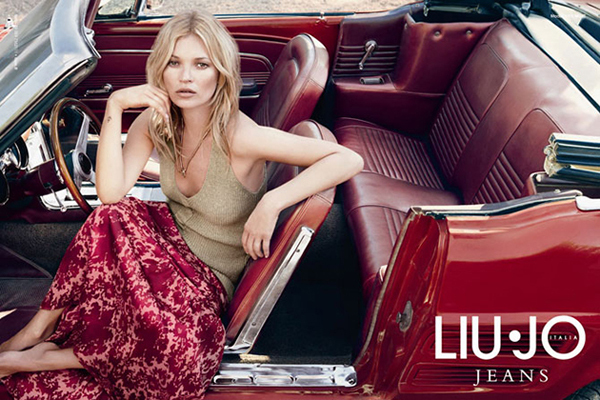 From the other side we have the Liu Jo Jeans spring summer 2013 campaign, where Moss poses inside the cherry old-fashioned car. This particular collection features the more casual garments with the relaxed feel for the everyday wear such as short denim shorts, printed tees, leather jackets, tops with the vintage vibe and maxi skirts. In spite of the casual style, this Liu Jo Jeans spring summer 2013 collection is truly bold and chic. Whether you are going to attend the special event or simply want to look great on the daily basis, you will surely find the trendy garments in this Liu Jo spring summer 2013 collection. Get inspired by these two amazing campaigns and get the style update with the glam touches.